The trailer for December's Spider-Man: Into the Spider-Verse doesn't give us too many details, but we know that it won't be the first use of the word "Spider-Verse." The 2014 Marvel Comics event Spider-Verse is the inspiration for the new animated film. It ran through multiple Spider-Man titles, as well as a couple of miniseries designed just for the event. Its impact on Marvel Comics was huge. 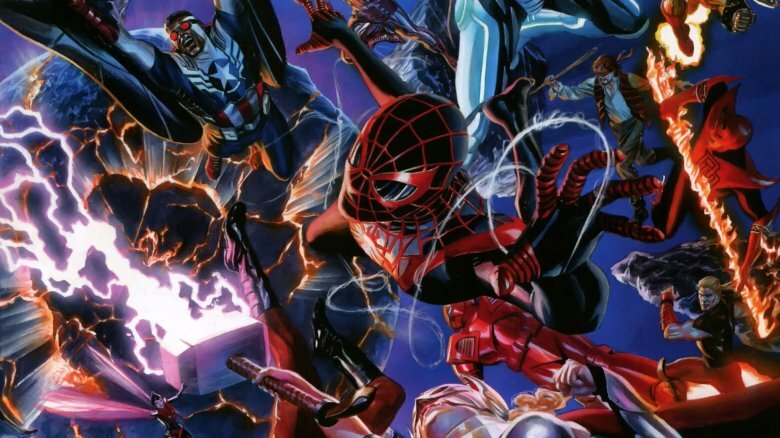 Spider-Verse contributed to the larger narrative that led Marvel to the cataclysmic 2015 Secret Wars event, led to new regular monthly titles, spawned sequels and other "Verse" events, and showed just how versatile a single Marvel franchise could be. In the 2005 event Spider-Man: The Other, Peter Parker learned he was more than just a guy who happened to get chomped by the wrong spider — he was part of an ancient animal totemic legacy. 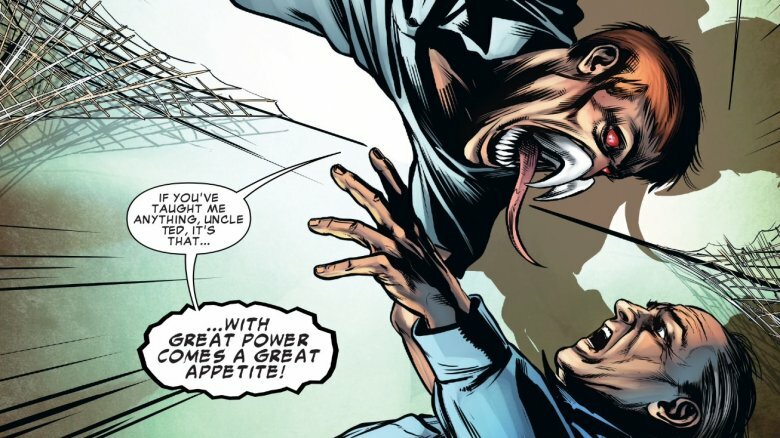 Spider-Man faced Morlun, a powerful villain who not only named all Spiders his enemy, but actually fed upon them. Spidey was able to defeat Morlun but in 2014's Spider-Verse, he faced entire family of Morlun's ilk — known as the Inheritors — who devoured Spiders from multiple realities. Since the Peter Parker from the Marvel Universe proper (a.k.a Earth-616) was the only Spider known to defeat an Inheritor, he led the charge against the cannibals. For more, here's the untold truth of the Spider-Verse. 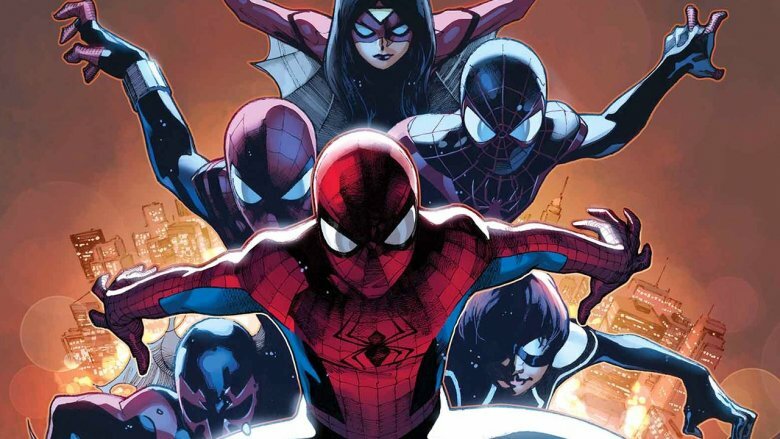 When Spider-Verse was announced, writer Dan Slott and editor Ben Morse promised the inclusion of "every Spider-Man in every universe," and that's exactly what they delivered. A lot of the more prominent Spiders were familiar to Marvel fans. There was Miles Morales of the Ultimate Marvel Universe, Spider-Girl of the MC2 world where Peter Parker was her father, the gun-toting Peter Parker from Spider-Man Noir, the future Spider-Man from the 2099 comics, the Bruce Banner Spider-Man from Bullet Points, and of course the talking pig Spider-Ham from a world where Marvel's heroes are replaced with talking animals. At the same time there were plenty of soldier Spiders joining Parker from Earth-616 like Spider-Woman, a time-displaced Superior Spider-Man (Peter Parker's body with Doctor Octopus' mind), and the relatively new hero Silk. But that was the tip of the iceberg. Along with all the known Spiders were hordes of new ones. An English Spider-Man, a cyborg Spider-Man, an assassin Spider-Man, a Spider-Punk (complete with metal spikes sticking out of the top of his mask), a werewolf Spider-Man, and even the Aunt May hero Spider-Ma'am. Yes. You read that correctly. Spider-Ma'am. Most of the Spiders are killed and devoured by the Inheritors long before Spider-Man's army can find them; or even before it's formed. Even after the Spiders start working together, the body count grows. Spider-Verse is one of the most brutal Spider-Man stories you could read, and the pile of bodies stacks high. While other artists and writers contributed to Spider-Verse, the event was the brainchild of longtime Spider-Man writer Dan Slott. 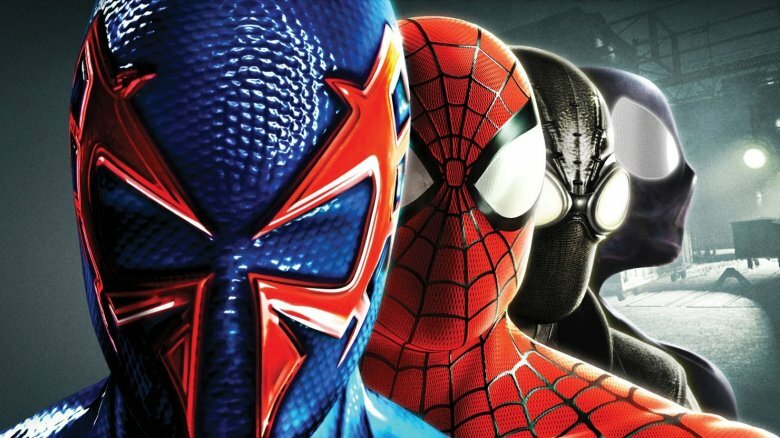 When Slott and editor Ben Morse announced the event, Slott revealed the inspiration for Spider-Verse was the 2010 video game Spider-Man: Shattered Dimensions. Slott wrote the video game and he said he'd been working on Spider-Verse ever since. In Shattered Dimensions, the oracle character Madame Web recruits four versions of Spider-Man from different realities to retrieve an artifact that was smashed and scattered across their four worlds. There's the "regular" Earth-616 Spidey, Spider-Man from the year 2099, the black-clad Spider-Man of Spider-Man Noir, and the Peter Parker from the Ultimate universe who was merged with a symbiote (Miles Morales would not assume the mantle of Spider-Man in the Ultimate comics for another year). The different Spiders don't form any kind of team — instead working individually in their respective realities — but they are aware of the others and work in concert. It's easy to see how Slott used this as inspiration for a story with a much broader scope. Like all big Marvel events, the point of Spider-Verse was to make money. But part of what made Spider-Verse unique was that more than a cash grab, it was a celebration of comics. Spider-Verse was by no means the first comics event to deal with alternate realities and is in no danger of being the last, but Slott and company used the multiverse concept with a more metafictional bent. Much of the event's multiverse was made up of worlds inhabited in different genres of comics. For example, one world had the Spider-Man of the daily newspaper strips. Morlun attacks Parker and Mary Jane while they're at a picnic, and the villain gets frustrated with the dialogue. Because the strip was only a few panels, Parker repeats all of his dialogue every few panels (so readers would remember what happened the following day), and the Inheritor can't figure out what's going on. In another, more darkly hilarious example, Morlun hunts and kills the Spider-Man who used to appear in print ads for Twinkies and Hostess Pies. It ends with Spider-Man dead, and Morlun saying, "What a sweet and succulent soul you have! The greatest snack of all!" One of the more well executed examples came in Edge of Spider-Verse #4, with a cover and content that was more horror comic than super-hero. Its protagonist didn't become a hero, but instead terrorized and murdered most of the people in his life, only to be consumed at the end by the Inheritors. Wonderfully, while Spider-Verse celebrated comics, that doesn't mean it stopped with comics. When Slott said the event would include every Spider-Man ever, he apparently meant it, and he didn't just mean the ones appearing in panels. A moment in Spider-Verse that manages to be both hilarious and absolutely soul-crushing comes in Amazing Spider-Man #7 when Morlun kills the Spider-Man of the '80s cartoon Spider-Man & His Amazing Friends. His buddies Iceman and Firestar get taken out too, and the scene ends with Firestar's dog Ms. Lion, whining helplessly among her friends' corpses. But Slott doesn't stop with the eighties. 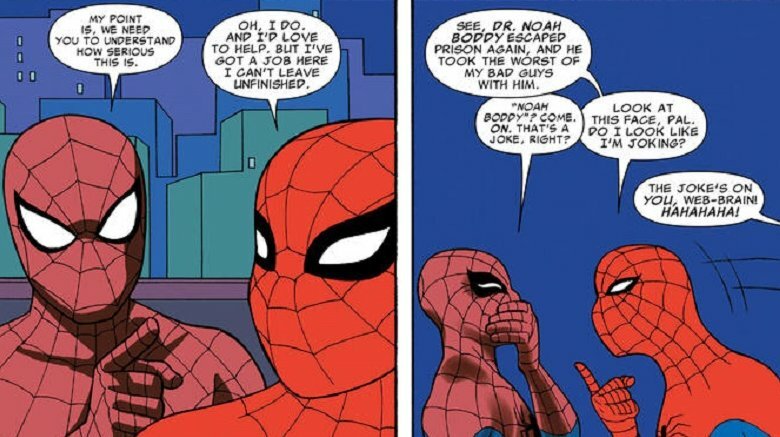 In Spider-Verse Team-Up #2, Earth-616 Spider-Man and Miles Morales make a new friend — the much goofier Spider-Man of the 1967 Spider-Man animated series who deals with villains like Dr. Noah Boddy. The creators play with the differences between versions of the character by making the more contemporary Peter Parker doubt his alternate from the '60s is taking things seriously enough. The only alternate Spider to be introduced in Spider-Verse to subsequently get a regular monthly series is the Gwen Stacy Spider-Woman or, as it says on the cover of her comic, Spider-Gwen. First appearing in Edge of Spider-Verse #2, Spider-Gwen is a mash-up of the traditional Spider-Man and Peter Parker's love interest Gwen Stacy whose death in 1973's Amazing Spider-Man #121 is often cited as one of the moments that ended the Silver Age of comics and started bringing superhero stories to darker and more mature places. But in Spider-Gwen's world, she never died because it was Gwen, not Parker, who was bitten by a radioactive spider. In the meantime, her world's version of Peter Parker grew so isolated that he eventually became The Lizard, and died in battle with Gwen. 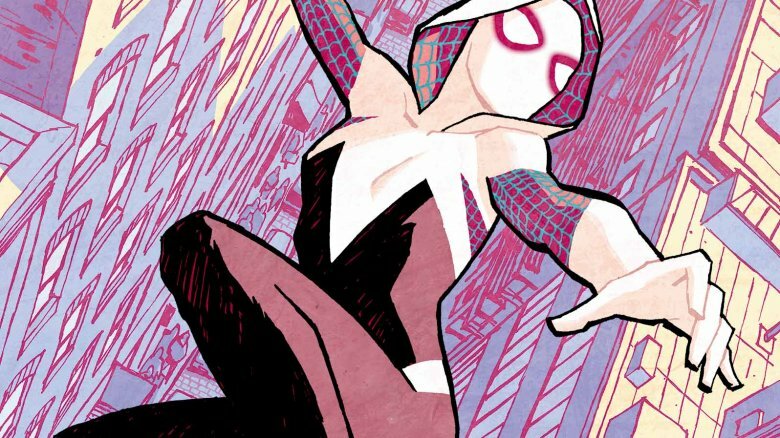 Spider-Gwen has already become a regular Marvel fixture. She's confirmed to appear in Spider-Man: Into the Spider-Verse as well as Marvel Rising: Secret Warriors. She's shown up in the animated series Spider-Man and Ultimate Spider-Man, and is playable in eight different video games including Marvel: Contest of Champions, Marvel: Future Fight, and LEGO Marvel Super-Heroes 2. While Spider-Verse didn't really spill into any comics outside of Spider-Man's stable of titles, its narrative impact was felt all across Marvel. It was one of the major events to contribute to the cataclysmic Last Days event, and the resulting Secret Wars that ended all of Marvel's regular titles temporarily. It was revealed in Marvel's Age of Ultron event that the constant tampering with the timeline and alternate realities by comic book heroes and villains was causing serious damage to the fabric of the universe, and that damage was what helps lead to the end of the Marvel Universe in Last Days. One character in particular directly contributes to this universal Armageddon. Spider-Man's army included a time-displaced Superior Spider-Man — Peter Parker's body usurped by the mind of Doctor Octopus. At this point Peter Parker had already regained control and Octopus had heroically sacrificed himself, but Ock didn't know that yet. When, after the defeat of the Inheritors, Superior Spider-Man learns what's in store, he isn't happy about it. The final battle against the Inheritors takes place near the Web of Life and Destiny. When he learns of his fate, Superior Spider-Man begins to physically tear the Web apart, literally changing time and reality with his bare hands, hoping some of his destruction will break the strand of time that leads to his death. The other Spiders stop him, but the damage was already done. Not to be outdone by his oldest rival, Venom — who had just been reunited with host Eddie Brock — had his own alternate reality event: 2017's Venomverse. Like Spider-Verse, the Venom event featured different versions of Venom from all over the multiverse. 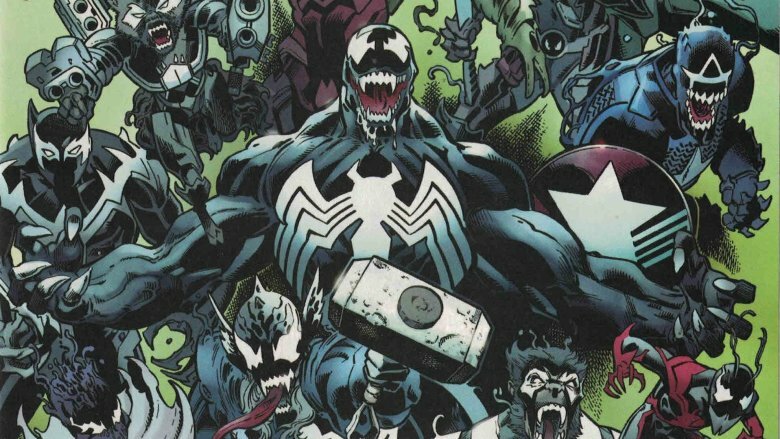 In Venomverse's case, we saw versions of the symbiote that had merged with other superheroes or supervillains. The Venoms banded together to protect each other from the Poisons — an alien race that was ruthlessly hunting all symbiotes and their hosts across the multiverse. The event began with Edge of Venomverse. Each issue featured tales of different heroes who had become Venom hosts, and each story ended with a Venomized Captain America appearing to recruit that hero into the war against the Poisons. When the main series Venomverse began, the allied symbiotes included the Eddie Brock Venom along with Venomized versions of Captain America, Ghost Rider, Deadpool, Rocket Raccoon, Doctor Strange, Ant-Man, X-23, and more. Spider-Verse didn't waste any time before making its way into other media. 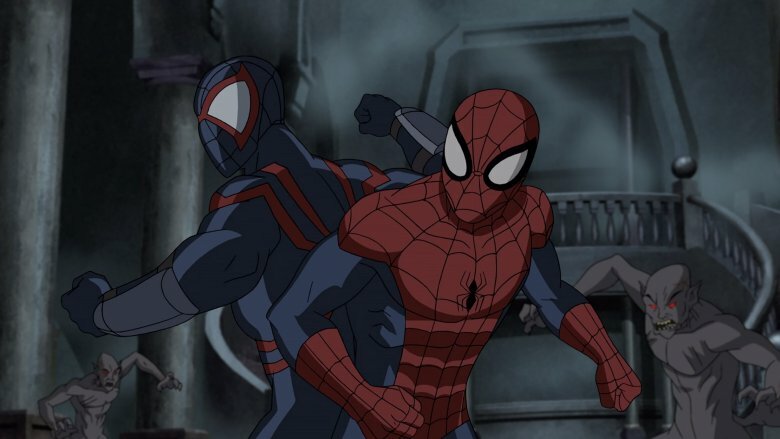 The third and fourth seasons of the animated Ultimate Spider-Man featured stories heavily inspired by Spider-Verse, and included characters like Miles Morales, Spider-Ham, Spider-Man 2099, and others. Beyond television, Spider-Verse has been heavily featured in Marvel video games of the later 2010s. Spider-Verse was used for a mission in the social network game Marvel: Avengers Alliance, and the mobile game Spider-Man Unlimited was based on the event's plot while being used specifically to promote the comics. Characters like Miles Morales and Spider-Gwen are featured in games like Marvel: Future Fight and Marvel Contest of Champions. While Spider-Verse isn't mentioned specifically in the game, almost all of the most prominent Spider-Verse characters are playable in LEGO Marvel Super-Heroes 2. Of course there's December 2018's Spider-Man: Into the Spider-Verse. We won't know until its release how closely it mirrors the comic book event, but the trailer already makes some deviations clear. For one it seems like Miles Morales, rather than Peter Parker, is the main protagonist of the film. For another, considering the family-friendly tone of the trailer, it seems unlikely we'll get anything close to the brutality of the comic book event. 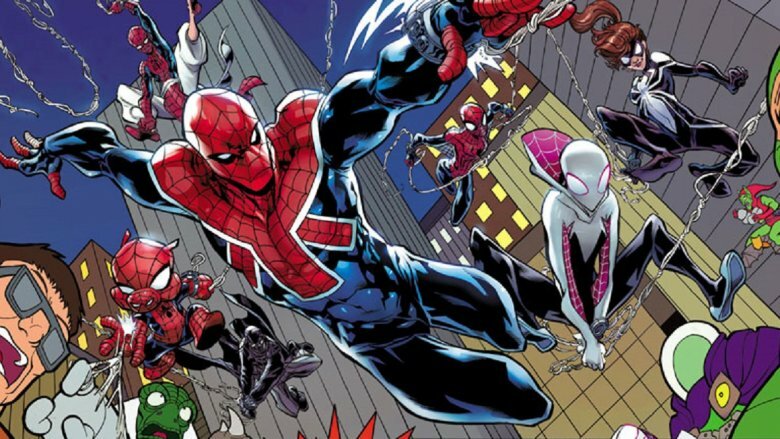 Marvel started teasing an event called Spider-Geddon in May. Details are being kept firmly under wraps, though it's obvious the story will be related to — if not a direct sequel to — Spider-Verse. One of the promo images reveals many of Spider-Verse's stars including Miles Morales, Silk, Spider-Man 2099, and Spider-Gwen. And just like Spider-Verse included Spiders from other media, Insomniac Games confirmed that the Spider-Man of the upcoming Marvel's Spider-Man PlayStation 4 game will be one of Spider-Geddon's heroes. Spider-Geddon begins in August 2018 with Edge of Spider-Geddon. We don't know a lot of specifics, but solicits for the event's first two issues — Edge of Spider-Geddon #1 and #2 — were released. 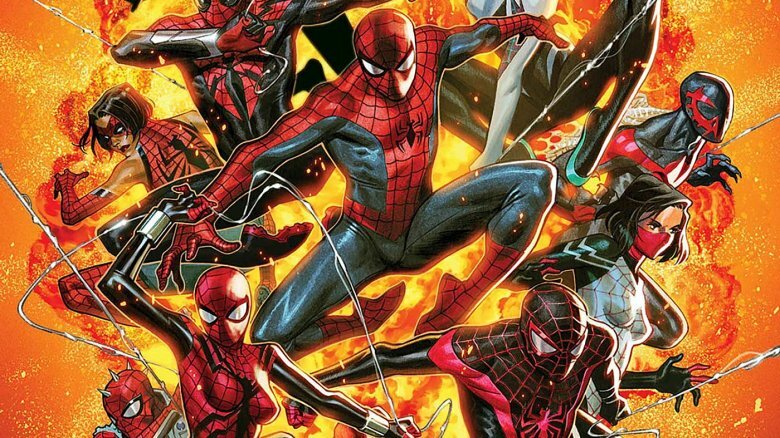 One of the biggest questions posed by the images released so far is: what's Superior Spider-Man doing there? Is he somehow time-displaced like the version from Spider-Verse, or is this a version we haven't seen before? Possibly an alternate version of Superior Spider-Man who never gave back the mantle to Peter Parker? We'll find out in August. But already Spider-Geddon has managed to surprise us in one way: considering the events of Spider-Verse, it's a shock there are enough Spider-Men and Spider-Women (and, we hope, Spider-Pigs) left alive anywhere in the Multiverse to make another Marvel event.